Gluten Free Italian Food At Toscana’s! 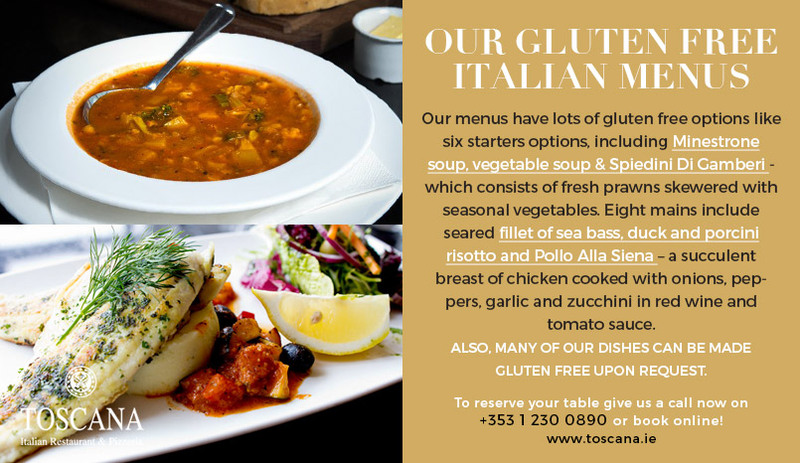 15 Feb Gluten Free Italian Food At Toscana’s! Everyone knows that Italian cuisine is the most famous and much-loved European food. For variety, taste and healthiness it can’t be beaten. But does it cater to all? What about those with gluten disorders? You might think that Italian food with its breads, pastas and pizzas is a no-no for those on a gluten free diet. Well, you’d be wrong. Italy is considered one of the best destinations for those who must eat gluten free. The level of awareness of gluten disorders amongst ordinary Italians is very high. This may be largely due to cultural factors: the sharing of food is such an important ritual in Italian life that leaving someone out because of a gluten disorder is unheard of. 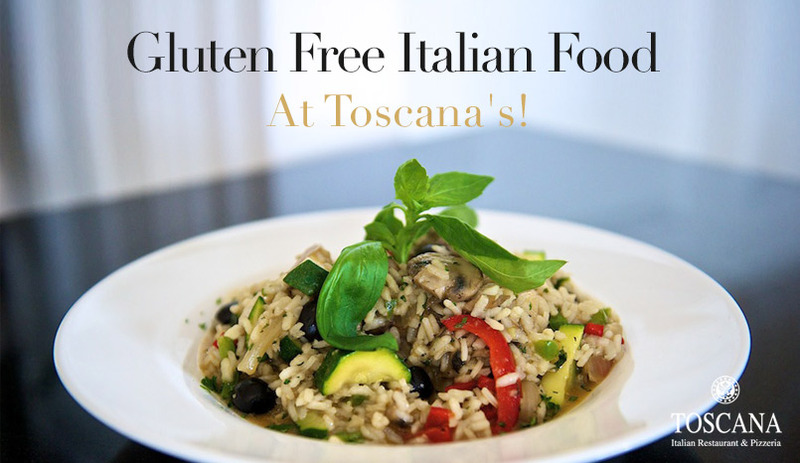 Here at Toscana’s we are proud to live up to that tradition of inclusiveness by offering a gluten free menu. Celiac disease is a serious gluten disorder that can cause severe gastro-intestinal problems. The only known effective treatment is a strict, life-long gluten free diet. 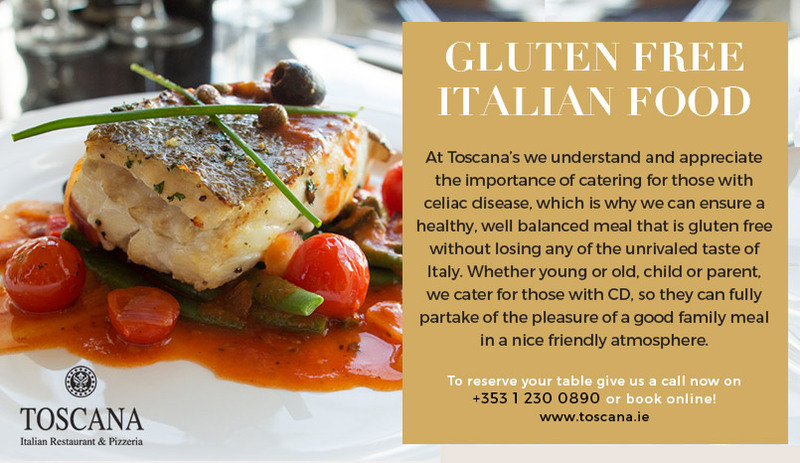 At Toscana’s we understand and appreciate the importance of this, which is why we can ensure a healthy, well balanced meal that is gluten free without losing any of the unrivaled taste of Italy. Whether young or old, child or parent, we cater for those with CD, so they can fully partake of the pleasure of a good family meal in a nice friendly atmosphere. We believe that a gluten disorder should be no barrier to a first-class dining experience, which is why we have especially prepared gluten free menus. Relax and enjoy a delicious, healthy, full course meal without worrying about gluten content. Our chefs are fully up to speed with gluten free alternative foods, so you can enjoy a genuine Italian culinary odyssey safe in the knowledge that it is completely gluten free. We aim to make those with CD and other gluten disorders feel welcome and not exceptional or awkward or in need of special treatment. These disorders should not get in the way of a good, inclusive, satisfactory meal, be it for the family, a business meal or a romantic dinner for two. Our menus always use award winning organic ingredients and have lots of gluten free options like six starters options, including Minestrone soup, vegetable soup and Spiedini Di Gamberi, which consists of fresh prawns skewered with seasonal vegetables. Eight mains include seared fillet of sea bass, duck and porcini risotto and Pollo Alla Siena – a succulent breast of chicken cooked with onions, peppers, garlic and zucchini in red wine and tomato sauce. Also, many of our dishes can be made gluten free upon request. So, if you suffer from a gluten disorder, don’t feel restricted by it as far as eating out goes. Avail of some genuine Italian hospitality and accommodation by visiting Toscana’s. You can relax in the knowledge that you are getting the best in Italian food, gluten free. Give us a call on +353 1 2300 890 or contact us online to make a reservation!